A new FTD Caregiver Support Group is being formed and the first meeting will be on March 9th, at the River House Adult Day Center in Cos Cob., 6:00-7 :15pm. Contact Ed Fitzgerald if you are interested in joining the group. AFTD is forming a team to participate in the Shamrock Shuffle 5K on March 12th, bringing greater FTD awareness to the surrounding Connecticut area, while also raising funds to help people affected by FTD across the country. This will be an outstanding opportunity for members of the local FTD community to meet and spend time together. Email bgraham@theaftd.org for more information about the race, and to say you’ll be there. You can also visit AFTD’s Givezooks page for registration information, and instructions on how to create a fundraiser. The Alzheimerʼs Association, Connecticut Chapter, is holding its 19th Annual Education Conference on April 7th in Cromwell, CT. Details. I’ve been to the conference three times and have to found it to be very helpful. Would highly recommend it for caregivers. There is a session on FTD. “This session will review the symptoms, diagnostic criteria and key points about providing clinical care for patients with behavioral variant frontotemporal dementia and primary progressive aphasia.” The presenter is Scott M. McGinnis, M.D., Massachusetts General Hospital Frontotemporal Disorders Unit. 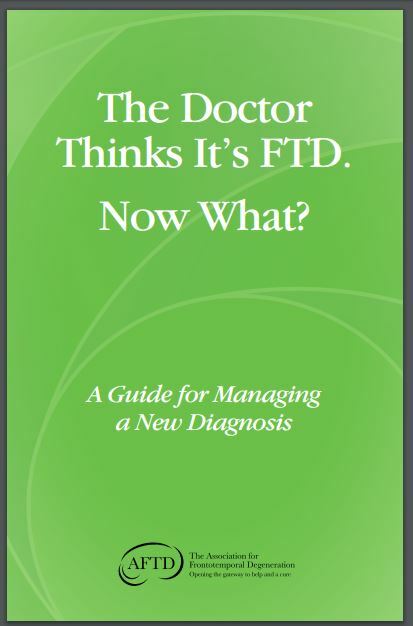 This booklet reflects the experience of thousands of individuals and families who have faced a diagnosis of FTD and the professionals who work with them. You will find suggestions for how to adjust to the changes in your life and build confidence in the decisions you make. Developing a strategic approach to the disease will help you live today fully and prepare for the future. The CT FTD Foundation 5th Annual Wine Tasting will be held on Saturday, March 12th, 2016 at the DoubleTree by Hilton in Bristol. We hope we have finally found a modern venue that can accommodate our growing needs and help us deliver a fabulous event. Tickets are $35.00 in advance, $40 day of event and will include appetizers, wine & beer samples. Raffle prizes and silent auction items will also be at the event as well. The AFTD released a new awareness video about FTD. With your help, they can reach a wider audience and educate more people about this rare disease.